Three years ago, aspiring filmmaker David F. Sandberg made and entered a three-minute short into a horror film competition. The short was named Lights Out, and it featured his wife Lotta Losten encountering an entity that was only visible once shrouded in darkness (you can watch the whole thing right here). Although it didn’t win the overall competition, it quickly went viral on YouTube and Vimeo, gaining over 10 million combined views, as well as the attention of many producers who saw the potential in making it a feature-length movie. It did eventually find producers (or else we wouldn’t be writing about it right now) in the form of Lawrence Grey and The Conjuring’s James Wan, and Sandberg was brought on board to direct from a adapted screenplay by Eric Heisserer, the writer of Final Destination 5 and the 2011 remake of The Thing. Even Losten was given a small part in the film, in an opening sequence that takes the basic structure of the short, and amps it up to eleven, complete with creepy mannequins and an even creepier moustache-less Billy Burke. Remarkably, the feature-length version only comes in at just over 80 minutes in length, but is that enough time to justify this short film being turned into, erm, a short film? 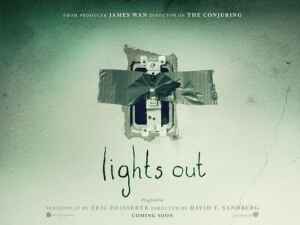 Not entirely, but luckily Lights Out is an entertaining, although not ground-breaking, horror film to keep audiences on edge enough to ignore some of its more obvious faults. The set-up is the same – demonic entity strikes when all the lights are turned off – but the major new addition is of its grasp on a small family, in particular a mentally-ill woman named Sophie (Maria Bello), whose young son Martin (Gabriel Bateman), her estranged grown daughter Rebecca (Teresa Palmer) and Rebecca’s boyfriend – even though she won’t admit it – Bret (Alexander DiPersia) try to get rid of the entity for their mother’s sake. But first, they must discover who or what the entity might actually be, and what its true connection to Sophie is. It’s a very simple structure, told very simply through some very simple scares and atmospheric shots, and Sandberg is able to deliver on the overall simplicity by keeping the focus exactly where it needs to be, in this case the family that this is all happening to. Themes of abandonment pop up frequently in the film, particularly with Rebecca who has become distant from her family, stemming from the abandonment of her biological father as a child. As a result, her reluctance to properly connect with anyone also causes a strain between her and Bret, who despite an eight-month relationship is still waiting for her to admit that she likes him in the long-term. These themes are brought up repeatedly during the film, sometimes in the middle of some of the more intense scenes, and it represents a very simple arc for this family, which is by every definition broken, to go through that makes them more human and identifiable, even when they’re experiencing something that is clearly not of this reality. The acting is very strong throughout, with Palmer being particularly strong as the film’s emotional core, and while Bello is clearly revelling in playing someone so unhinged, she never overplays it to a point where she just becomes a cartoon character, and even manages to be the creepiest thing in scenes where even the supernatural threat is lurking in the background. They all work well with the script’s numerous points of terror, and deliver effective and all-too-believable reactions to things jumping towards them or causing them genuine anxiety. Sandberg thankfully doesn’t go the traditional jump-scare route here, and while we can’t say that this was one of the scariest films we’ve seen this year so far, there were definitely times when even we got a few chills, and it’s partly down to the actors who make it all look too real. It might have benefited from another ten or fifteen minutes to go a little more into detail about some of the backstory with this supernatural being, or to establish some of its other “powers”, but overall Lights Out is fairly solid, and a fun piece of entertainment for horror fans to appreciate in their own way. Lights Out doesn’t change the horror rulebook in any way, and though its 81 minute running time makes it an easy sit it could definitely have benefited from a few extra minutes of screen time, but it has enough solid acting, effective scares and a strong understanding of suspense and dread to make it a decent and enjoyable piece of horror entertainment.